Heat oven to 375°F. Make cookies as directed on pouch without pressing with fork; cool 2 minutes on baking sheets; transfer to cooling rack. Cool another 3 minutes, then place 1 peanut butter cup minis in centre of each cookie. Cool completely on cooling rack, about 45 minutes. In medium bowl, beat softened butter and peanut butter with electric mixer on medium speed until well blended. Beat in icing sugar, milk and vanilla until smooth. Place frosting in decorating bag fitted with tip. 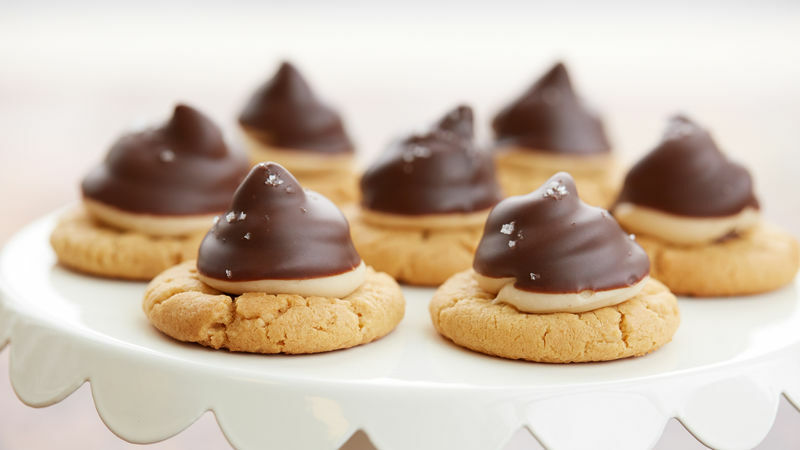 On top of each cookie, pipe frosting around and over peanut butter cup, getting as much height as possible, making cone shape with peak in centre. Place cookies in refrigerator while making chocolate coating, about 15 minutes. In small microwavable bowl, microwave chocolate chips and oil uncovered on High 30 seconds, then 10 to 15 seconds, stirring after each interval, until mixture is smooth. Dip cone-shaped frosting on each cookie into chocolate coating to coat most of frosting, letting excess chocolate drip off. Sprinkle with sea salt. If the chocolate coating is too thick, add additional oil a teaspoon at a time, stirring until smooth. Reheat in microwave 10 seconds, stirring until smooth, if needed. For chocolate coating, use milk or dark chocolate chips, if desired.